By Rachel Held Evans, on August 08, 2013. People often ask me what on earth was going through my mind when I decided to try a year of biblical womanhood. My answer is always the same: I wanted to start a conversation—about faith, about womanhood, about how those of us who love and esteem the Bible are to interpret and apply it to our lives. Of course, this conversation is best had among friends, in living rooms and coffee shops, over homemade meals and shared bottles of wine, during the Sunday school hour or in those precious few moments of fellowship squeezed between meetings, play dates and appointments. So it’s been such a joy to hear from readers who have used A Year of Biblical Womanhood for their book clubs or group studies. Many report that their discussions were filled with laughter, questions, honesty, encouragement, and a few friendly debates. With these experiences in mind, Katie Strandlund and I put together a FREE, downloadable discussion guide intended to help nurture conversation. It includes questions for discussion and ideas for action corresponding with each chapter as well as a list resources for those wishing to learn more about the topics addressed in the book, (perhaps from people who don’t conduct their research from the rooftops of their homes). You can download the discussion guide here. It will be available on the book page from now on. It is a humbling honor to be invited into the lives of my readers by way of my books. I hope this strange story of mine gives you much to talk about! Let me know if you have any questions or ideas. 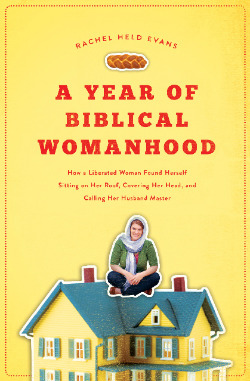 Did your book club or discussion group work through A Year of Biblical Womanhood? If so, how did it go? What worked? What didn't work?